i recently had an unusual experience... which started while i was laying in bed. before you cover your eyes in fright, i absolutely promise that this tale is rated G.
there i was, in the grips of my nightly struggle with sleep, when i was suddenly overcome by the sensation of traipsing through dewy tropical undergrowth. now, having spent a decent portion of my childhood in the Caribbean, i was cast back to memories of playing hide-and-seek by moonlight with my cousins in the veritable garden of delights that surrounded our grandparents' home. the memory of warm air, heavy with the fragrance of countless flowers in full bloom, is always a welcome intrusion on sleep, but it seemed out of place in my humble apartment in the middle of Montreal. however, i could not quite manage to escape that smell, and it kept getting stronger, until i felt like i was enveloped in a cloud of heady perfume. where was it coming from? my super-sniffer told me that it was coming from the direction of the window above the bed, but there was nothing on that window that would account for such an exotic fragrance... or so i thought. 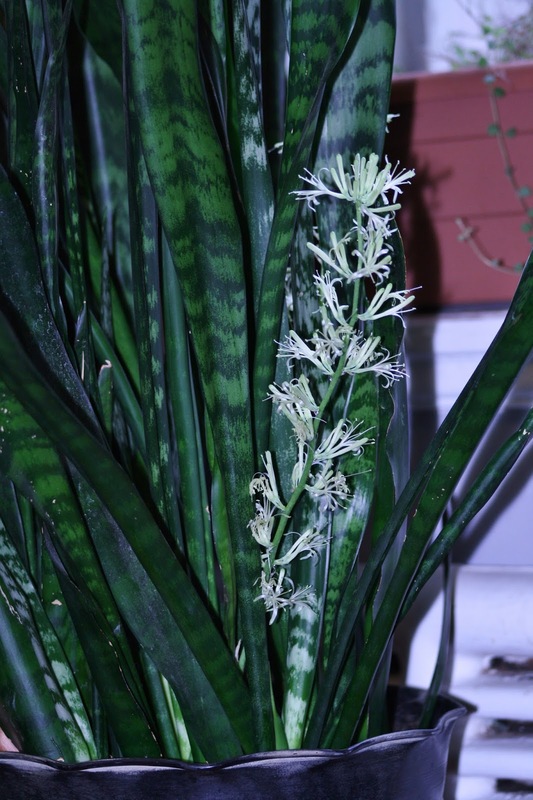 until that very moment in time, i had no idea that the humble snake plant (and its close-relative, mother-in-law's tongue) was capable of blooming... and bloom it does! i've had this plant since my grad school days, and it's followed me through my (brief) lecturing career, and even crossed the border to my current stay in Montreal. it's been replanted a few times, and has grown from the few leaves i purchased all those years ago in a tiny plastic pot to a large cluster in a bucket-size metal planter. the longest leaves are already threatening to touch the top of the window casement in which it's lived for most of the past two years. this is the perfect type of plant for lazy people. it thrives in low-light, and does not require constant moisture. i usually soak it once every two weeks or so, and let it dry out between waterings. turns out that this is precisely what it needs to bloom. it's a night-bloomer with pure white flowers that would practically glow by the light of the moon, and the intense fragrance out-perfumes any flower i have ever come across. it smells somewhat like a cross between a wisteria and night-blooming jasmine, but cranked up by a factor of 100. it was delightful... for the first day. by day 2, the scent was so over-powering, i was begging for it to stop. the base of each flower cluster secreted a thick, sweet nectar (yes, i couldn't resist tasting), an offering to the bats or moths that would pollinate the plant in its natural habitat. 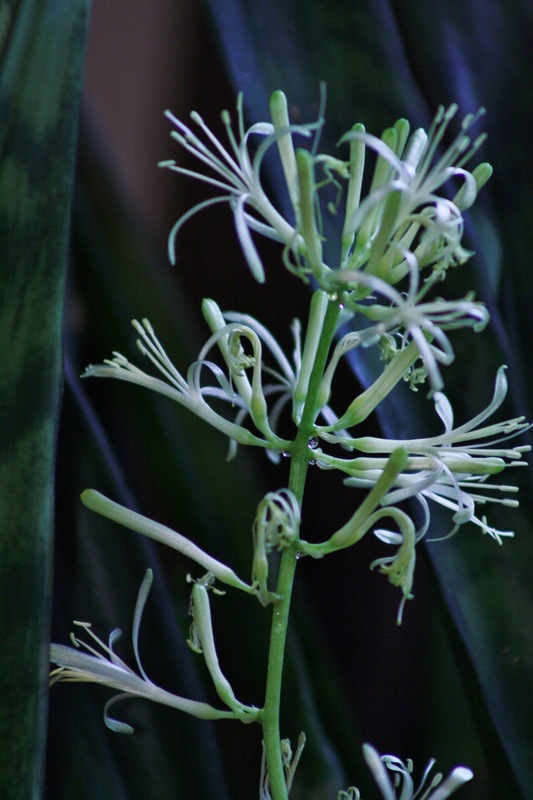 there were two flower stalks, each over a foot tall, and the flowers bloomed over a total of 3 nights, progressing from the bottom to the top of the stalk. 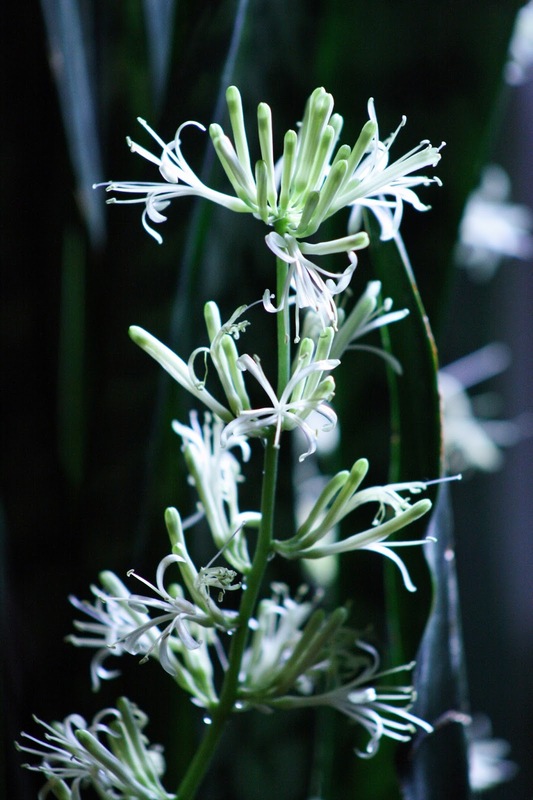 each individual flower bloomed only once, then gave way on the following night to the buds higher up the stalk. it was a magical experience.